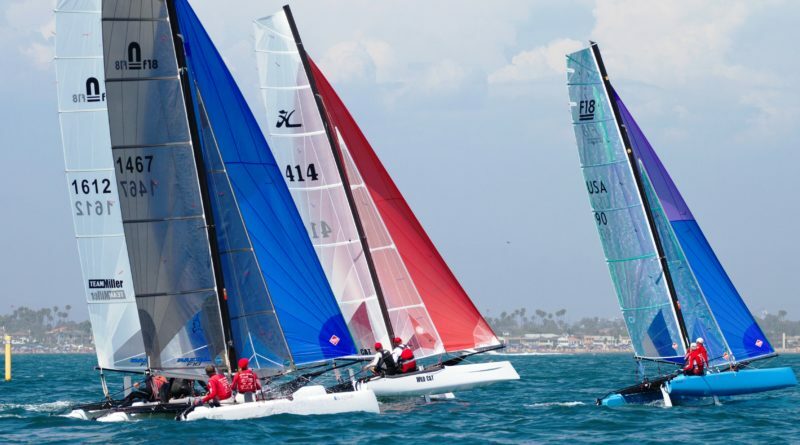 Catamarans race for four days in Long Beach following Labor Day Regatta. LONG BEACH ― Alamitos Bay Yacht Club (ABYC) welcomes the 2017 Formula 18 Americas Championship. The four-day race takes place in Long Beach, Sept. 6-9, two days after ABYC’s Labor Day Regatta. Sailors must have a boat membership with a National or International Formula 18 Catamaran Association to qualify for this race and are encouraged to fly their state’s or nation’s flag on their boat. “We expect to have 35 competitors including a team from Chile and last year’s National Champion from Florida Robbie Daniels,” regatta chair Eileen Haubl informed The Log. This regatta has a limit of 120 boats. A single fleet will race in a series, if the regatta consists of 80 or less registered boats. Otherwise, qualifying races will take place with more than 80 boats participating. Windward and leeward courses will be determined by the race committee based on the wind. The race committee plans to have two days of open ocean sailing off Seal Beach or just south of the Long Beach breakwater. Boats will race the other two days between the two oil islands within the breakwater. The entry fee is $400 per boat. Registered sailors can start arriving and signing in on Sept. 4 and 5. Sailors will be briefed on Sept. 6 at 10 .a.m. and will begin racing at noon. “We will have four races a day from Wed. to Sat. followed by music and food at ABYC,” Haubl stated. ABYC is sponsoring a food truck, music and photo booth for all participating sailors following the first day of races on Sept. 6. Gladstones is providing dinner to the sailors on Sept. 7. Dinner, music and raffle will be held upstairs at ABYC on Sept. 8. Prizes will be awarded to the top sailors after the final day of races, Sept. 9. ABYC is located at 7201 East Ocean Boulevard in Long Beach. More information on registering for the 2017 Formula 18 Americas Championship is on ABYC’s website, which is at abyc.org/regattas/f-18-american-champ-regatta. “The Formula 18 Americas Championship happens annually rotating between North and South America,” said Haubl.